Training workshop on "Community based waste management for climate change mitigation"
Begin of project implementation “Training and implement a pilot project for promoting composting of urban organic waste for climate change mitigation in Battambang City” COMPED has organized training workshop on “Community based waste management for climate change mitigation” on 17th to 21st July 2012, in Municipality Phitsanulok, Thailand. 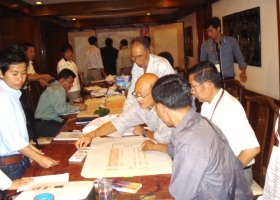 20 participants are invited to the training workshop. 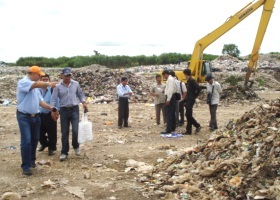 They are from provincial, city and local administrative, environmental department Battambang and residents, vendors of two communities around two big markets of the city “Psa Thmey 13 Makara and Psa Boeung Chuk” and waste collection company CINTRI. The objectives of this training workshop are i) giving the overview of solid waste management in Phitsanulok (including waste separation, collection, transport, final disposal, recycling activities, composting, regulation implementation and waste collection fee etc.) and Introduction community based waste management including benefits and challenge, ii) giving the overview about contributing of solid waste management of Phitsanulok Municipality in climate change mitigation and iii) using lessons learnt to strengthen actual implementation of climate friendly waste management practice in the city Battambang. During the training workshop the participants has learned and seen many important experiences on community based waste management and the Mechanical Biological waste Treatment - MBT is an approach in solid waste handling.